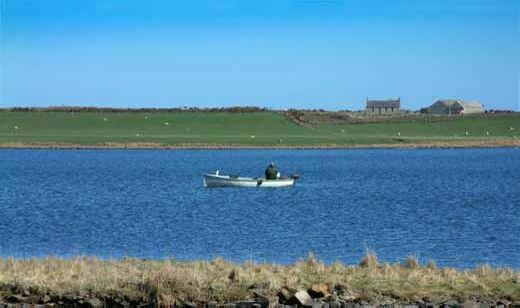 St John's Loch is situated near the village of Dunnet some 8 miles East of Thurso in the County of Caithness. With such a wealth of available trout fishing in the county the visiting angler may be somewhat spoilt for choice however, a visit to St John's is a must as the sporting quality of the Trout simply has to be experienced. A Marl bottom, average depth of 6' (2m) and excellent water quality ensures a steady supply of aquatic insect life in the Trout's diet. 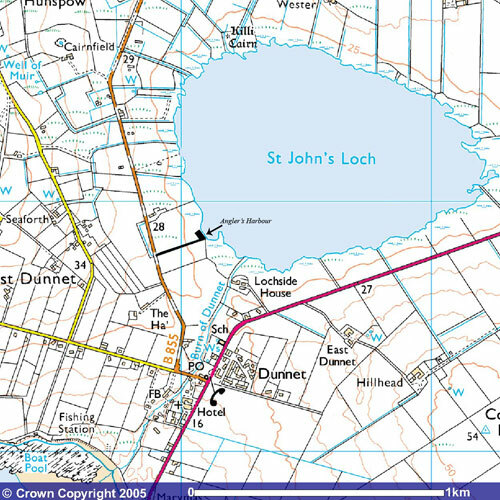 St Johns Loch also has the distinction of supporting the most Northerly hatch of Mayfly in the British Isles. This hatch starts during early June and continues throughout most of the month. Sport can be excellent with many fine specimens being landed during this period. Whilst the best of the fishing is to be had during the Mayfly hatch it can be very good at other times of the season. April and September in particular can be very good, they are traditionally the months when the loch has been known to give up some of its prize specimens, whilst May can produce quite a heavy Duckfly hatch. Even when the fishing is slow there is still much to be seen. Roe Deer, Fox and Otter are frequent visitors and a wide variety of land and sea birds including, Skua, Shag, Arctic Tern, Oyster Catcher, Curlew, Snipe and Osprey can provide added interest. The fishery is managed by the St John's Loch Improvement Association, a non-profit making organisation formed during the 1960's with aims dedicated to the improvement of the loch and its surroundings. The Association maintain a continuous program of works which have recently included extensive tree planting and landscaping, provision of a harbour storage building, secure boat tie-down and mooring points and the complete renewal of the water abstraction system for the Association's Hatchery. The Association carry out a carefully monitored stocking programme under the guidance of SNH and the Salmon and Freshwater Fisheries Laboratory. This sees the annual stocking of some 8,000 - 10,000 fingerlings and 1,000 'grown on' specimens all raised from indigenous brood stock. The Angler's Harbour is located on the West side of the loch and has provision for some 26 member's and 4 Association boats. Visitor permits for boat, float tube and bank angling are available locally at Dunnet Bay Camp Site, or by direct application to the Secretary/Boat Steward either by telephone or e-mail. The fishing season on St Johns Loch runs from 1st April to 30th September and now also includes Sunday Fishing. Fishing is strictly by Fly Only. Currently there is no bag limit although a minimum size rule of 12" (30cm) does apply.